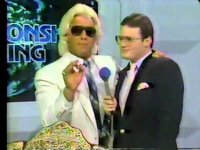 If you've ever seen a professional wrestling event live or on television, chances are you've seen Jim Cornette. Wrestling's "Louisville Slugger" is known to fans of the 80's wrestling boom as the tennis racket-wielding manager of perennial tag team champions the Midnight Express on SuperStation TBS--to 90's fans he's recognized as the manager of World Champions Yokozuna, the British Bulldog, Owen Hart and more in the World Wrestling Federation (now WWE), also appearing as a color commentator on countless pay-per-view events and telecasts of RAW on the USA Network--and for fans of the 2000's he spent several years as the on-air matchmaker and authority figure for TNA Wrestling on Spike TV. Jim will be appearing at LCTC due to his wrestling notoriety, but as a lifelong collector of comics, entertainment, pro wrestling and pop culture items, he will be as excited to be there as the fans in attendance, and will probably have a few rare comic-related items amongst the wrestling memorabilia at his booth for some wheeling and dealing to acquire things he needs or clear space in his collections for more! Jim and wife Stacey, his partner in crime, are noted for always having the "fun booth" at conventions and fanfests and we are thrilled to have them coming back to Lexington! Saturday March 10, 2018 :: 10:40 am	 Details Pre-Purchase this Photo Op!